Featuring serene colors of aqua and teal complimented by warm, sandy hues of khaki, gold and brilliant orange, Boho Beach is a collection styled to provide an artsy-bohemian element to your wardrobe. All pieces are handmade and one-of-a-kind. Elysian Studios guarantees 100% satisfaction with your purchase. 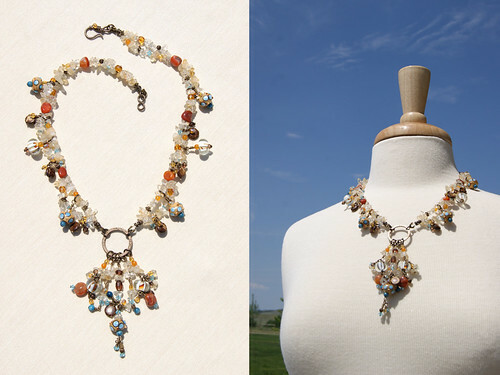 The BeachStar is a beautiful three-stranded hand beaded and embellished necklace. 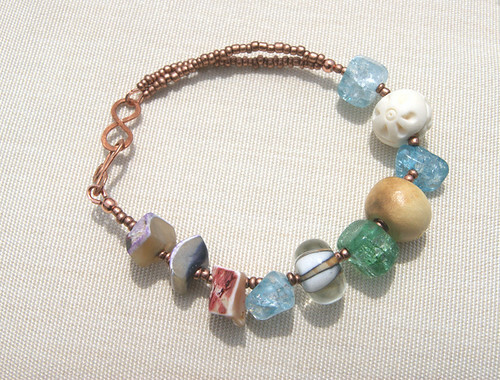 Gemstone chips of Goldstone sparkle against lampworked glass beads in cerulean, white and khaki. 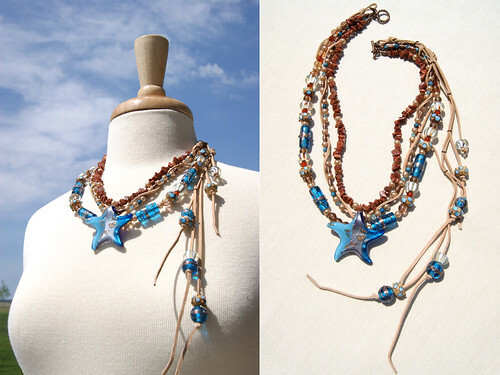 The striking fused glass starfish focal is complemented by boho-styled strands of natural suede lace. Carnelian faceted rounds, Crystazzi pearls in cream, transparent brown glass rounds, and antiqued copper tubes finish the beaded strands. A copper clasp closes the necklace in the back, and wire guards have been used to ensure durability. This necklace measures 12 inches from the clasp to the bottom of the star focal, and 16 inches from the clasp to the end of the longest suede lace. 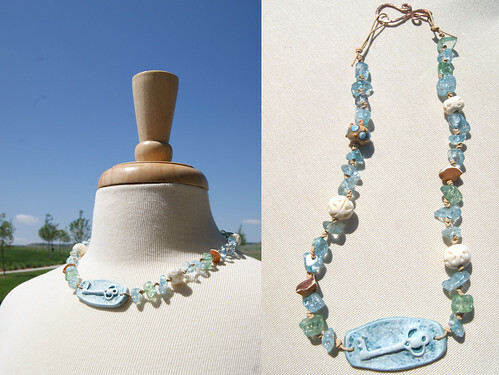 Boho BeachGlass will glitter everyday with its handmade links of looped copper wire and deep aqua glass. It is finished with handmade copper links and clasp, creating a very durable design. 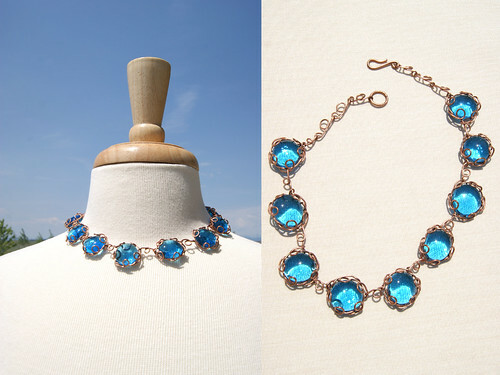 This choker style necklace measures 10 inches from the back clasp to the front center. 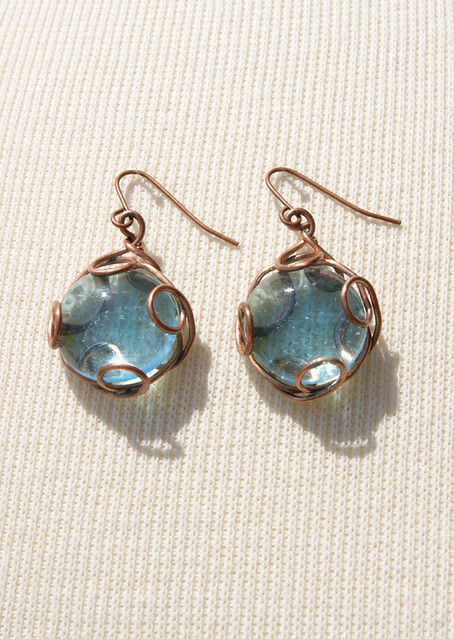 BeachGlass Earrings: Light blue glass beads* are hand-wrapped in copper wire loops to create unique earrings that have a 1 1/2 inch drop. They are finished with copper ear wires. "Elements (The Key to My Heart)"
The Key to My Heart features a lovely handmade polymer clay focal with a three-dimensional key on the face, and the words "TO MY HEART" on the reverse. The focal is 1 in high x 2 in wide. Beads of light green and aqua glass are complemented by genuine shell nuggets, lampworked glass and rounds that resemble carved bone. These are hand-knotted on natural 1mm leather cord and finished with a handmade, hammered copper clasp. The necklace has a 10 1/2 inch drape from the back of the clasp to the bottom of the key focal. Elements Earrings: Go simple, yet boho, with these handmade earrings featuring beads that resemble carved bone. 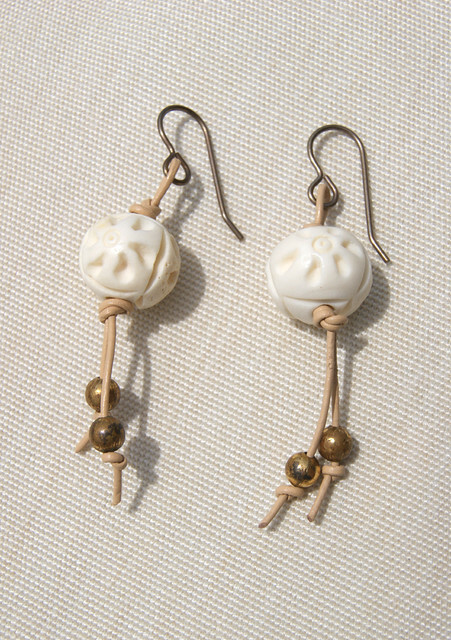 Hand-knotted 1mm natural leather lace is finished with rustic brass beads and Vintaj french ear wires. They have a 2 1/4 in drop. Elements Bracelet wraps your wrist in the soft pastel colors of the beach. Genuine shell nuggets in pink and gray are surrounded by copper seed beads, green and aqua glass beads, a striped lampworked round, a sand-colored clay bead, and a cream bead resembling carved bone. The bracelet is finished with copper wire guards for durability and a handmade, hammered copper clasp. Butterfly Beach Breezes is a very special piece, and one of my favorites in this collection! The ceramic teal and gold focal (1 in. x 2 in.) is handmade by MaryAnn Carroll, as well as the coordinating accent beads. The 1 1/2 in. toggle clasp is handmade by Erin Fickert-Rowland from copper polymer clay, using the mica shift technique, and shimmers beautifully in the light. Beads of yellow jade and copper complement the design, and a copper butterfly is wrapped onto the focal, providing a delightful element of whimsy. 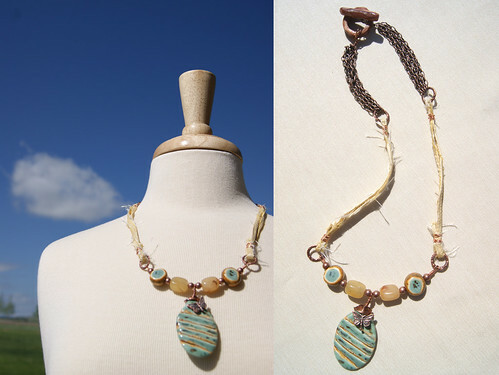 Copper chain and handmade silk cord in cream finish the piece. The necklace has a 14 inch drape from the back of the clasp to the bottom of the focal. Butterfly Beach Breezes Earrings coordinate perfectly with the necklace, and feature the beautiful ceramic rounds of MaryAnn Carroll. Hand-linked on antiqued copper ball-tipped headpins, these beautiful teal and gold beads are complemented by antiqued copper rounds and yellow jade rounds with copper bead caps. 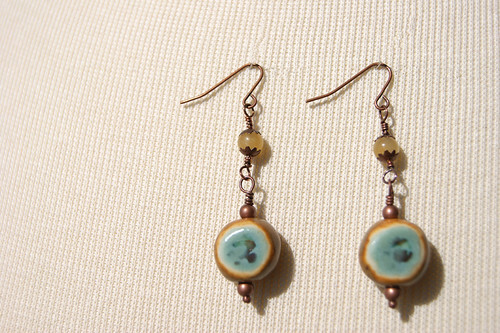 Finished with antiqued copper ear wires, these earrings have a 2 1/4 in drop. Eternal Boho Beach is truly the star of this collection. Featuring extensive hand-linking, gemstones and a show-stopping design, this statement piece is sure to make it's wearer feel gorgeous. Two beaded strands of Citrine gemstone chips, carnelian nuggets, fire-polished czech glass, and Swarovski crystals interlace and are complemented by linked dangles of lampworked glass and wooden disc beads. The focal is a Vintaj Eternity ring with five clustered, hand-linked dangles that showcase the beautiful beads featured in the entire necklace design. The piece is finished with wire guards for durability, a Vintaj clasp, many Vintaj flower spacer beads and jump rings, and exclusively uses Vintaj headpins and eyepins for linking. The necklace has a 14 inch drape from the back clasp to the bottom of the focal. The focal measures 1 in. wide x 4 1/2 in. long. Eternal Boho Beach earrings are dramatic, yet fun, and feature all Vintaj brass components. 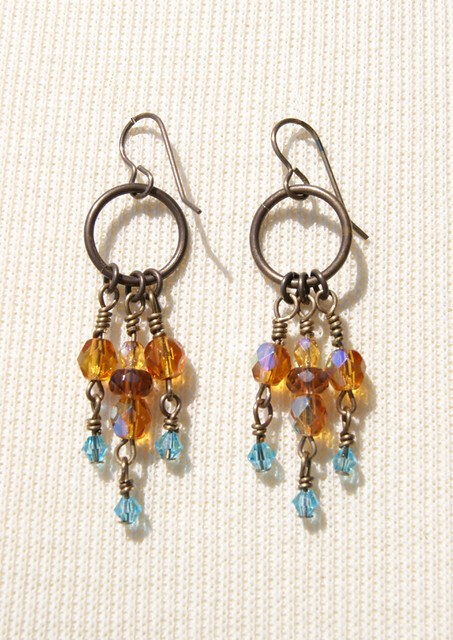 Beads of topaz fire-polished czech glass, brown faceted glass rondelles and teal Swarovski crystals are hand-linked and hang artfully from 15mm jump rings. The earrings have a 2 1/4 in. drop and are finished with Vintaj French ear wires. I can just FEEL the waves, the sun, the sand! I miss those here in dry, sunny Arizona. Lovely! Thanks so much, Georgene! I miss the rolling waves of the beach here in Colorado too. These pieces bring the beach vibe a bit closer! Thank you, Christine! I love that piece too!